While dedicated to improving the dentist, team, and patient experience, Jonathan A. Bregman, DDS, FAGD has a strong passion for educating dental professionals about early oral cancer detection, the oral systemic connection and growing a practice “from the inside”. He utilizes facilitated learning concepts and audience interaction to help attendees retain key concepts. Attendees leave refocused, energized and with their own action list to implement these principles back in the office. 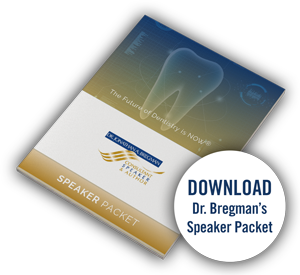 With over 30 years in dentistry, Dr. Bregman remains committed to learning – as evidenced by his Fellowship in the AGD. As a continual student, he easily relates to his audiences. He has walked in their shoes, sat in their chairs and understands their challenges. He has had conversations with thousands of audience members and has a finger on the pulse of the industry in regard to these topics.